Transparent & simple cost structure. No membership, monthly or hidden fees! You pay only when you send a parcel with us. And this payment contains everything: fees for our partners DHL, FedEx, DPD, GLS, UPS, DBSchenker and all services rendered by us. The shipping costs depend on various parameters, which we don’t know until we have your parcel at our warehouse. Crucial factors are for example the latest currency rates and actual dimensions of your package (which define the dimensional / volumetric weight and combined length and girth). Once your parcel is with us we define the final costs, which you will be able to see and compare in your account before shipping. Your items are too heavy, too big or not standard? How do we calculate our cheap international shipping rates? For our services you won’t be charged separately, they are simply included in the price! The parameter that affects costs the most is the cost of transportation. This depends on the actual size and weight of the parcel. 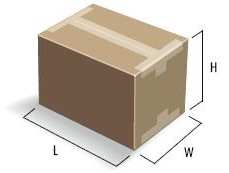 As the transportation costs are rather defined by space, than by the actual weight, we are forced to use the dimensional / volumetric weight and the girth measure as soon as your package dimensions exceed certain parameters. … is measured on the basis of the parcel’s circumference. If a parcel exceeds the limits specified by our partners, the shipping will be affected on the basis of the respectively applicable rate class. These maximum lengths differ from country to country. They must not exceed a value of e.g. approx. 300-360cm (DHL) or 460-762cm (FedEx). For standard packages we normally do not worry about it. … is compared with the actual weight, whereas the higher value is used to determine the freight cost. This means that a lightweight picture frame may turn out more expensive than a heavy television, because the picture frame is larger in size and volume than the small television. Our Shipping Costs Calculator already considers these restrictions! You are interested in delivery details to your country? What kind of costs do occur? You pay only one fee once you forward! This includes transport costs incurred on the part of our partners and our services. You do not pay any monthly or additionally fees. If you use our Concierge Service, further costs can be involved. That could be the Concierge fee (10% of the order value, costs min 3,00 €) and/or the Pick up fee (minimum standard fee 20,00 €, higher costs are possible). For commercial purposes may or may not additional costs occur, e.g. customs declarations. At your customs costs can occur, because spot checks on parcels are conducted. In cases where additional charges may insure, the payment of these will be paid in advance and invoiced to you by our partners. Learn more about your rates for cheap international shipping from Germany to your country. When do myGermany fees occur? or if commercial declarations are needed: in case myGermany needs to do it = 20,00 € per 5 customs tariff numbers. Check your cheap international shipping rates from Germany to your country. Why actual and calculated international shipping rates may be different? Our total international shipping cost depends upon various factors, which we don’t know definitely until your parcel is in our hands: latest currency rates, latest fuel surcharges and actual weight and size of your package, whereas the latter two define girth measure and dimensional / volumetric weight.